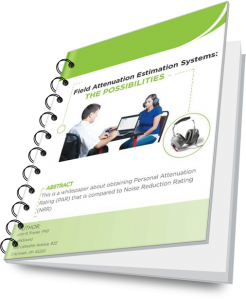 This is a whitepaper report written by Dr. John Franks about obtaining Personal Attenuation Rating (PAR) that is compared to Noise Reduction Rating (NRR). There are methods involving having a person balance the loudness of a signal presented to an open ear to that of a signal presented to an ear occluded with an earplug. There are methods that employ the use of a sub-miniature or probe microphone placed in a surrogate protector to predict what attenuation a user would receive when wearing the actual hearing protector in a similar manner.